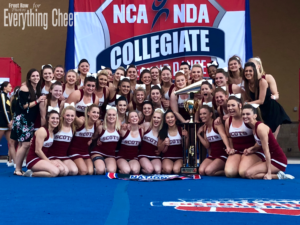 On April 5th and 6th, over 6000 collegiate cheer and dance athletes gathered in Daytona Beach for an annual spring break tradition – the NCA Collegiate Cheer and Dance Championship. 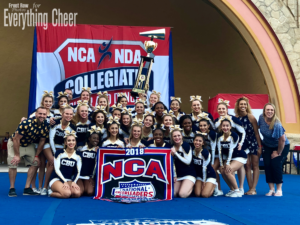 The highlight of this competition is the opportunity to compete outside in the legendary Daytona Beach band shell, in front of a huge crowd of cheer fans and beachgoers alike. This year’s competition brought two new divisions, along with the usual favorites. This year, all eyes were on the Junior College division. While it was the smallest division of the competition, featuring only two teams, it was also the toughest and arguably the most exciting division. 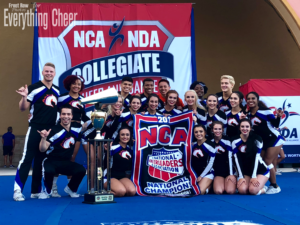 The two teams, Navarro College and Trinity Valley Community College, have been fighting over the top spot for years, with TVCC winning the last two years. After finishing day 1 in second place by 0.26, Navarro was determined to finish the competition with a strong day 2 performance. 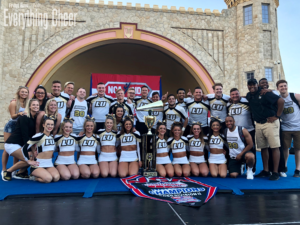 They were able to achieve their goal, hitting a zero deduction routine in front of a packed band shell, and were able to beat out TVCC to secure their 13th national title and their 5th grand champion title with a score of 98.13. 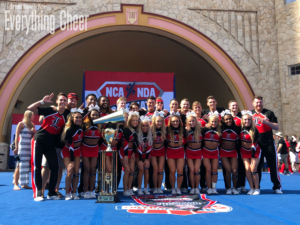 In another fan-favorite division, Coed D1A, all eyes were on the University of Louisville, Oklahoma State University, and Texas Tech University. Last year Texas Tech was able to take home their first national title since 1982, so expectations for their program were high going into this season. Texas Tech sat in second place going into finals, behind the University of Louisville, who always seem to be the team to beat every year. In the end, neither Texas Tech nor Oklahoma State were able to outscore the University of Louisville, with OSU finishing in second place and Texas Tech finishing in third. 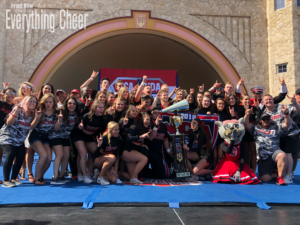 This marks the University of Louisville’s 18th title in the Large Coed D1A division. 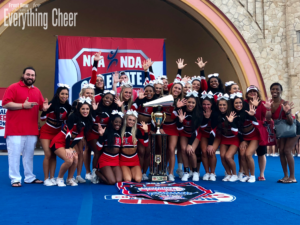 The University of Louisville were also able to capture the gold in the All Girl D1A division, bringing home their 5th consecutive title and their 15th in 20 years. 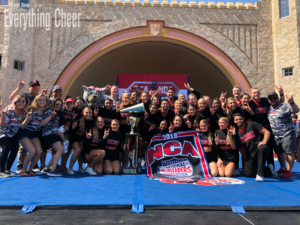 NC State was another program that walked away from Daytona Beach with two new national championship wins, one in the tough Small Coed D1A division, and one in the new Game Day DI division. This makes 7 total national titles for the Pack! In the Game Day division, NC State put on a show by bringing in their marching band, twirlers, and dance team to assist them in leading the crowd as they would on game day. 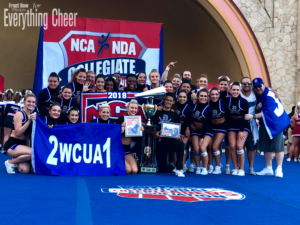 The most touching and heartfelt moment of the competition came in the Small Coed DII division, where Blinn College’s routine paid tribute to a teammate who passed away in January. 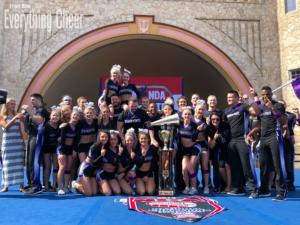 Their performance was good enough to place them in first both days, and the team held up photos of their fallen teammate when they received their trophy and banner. Congratulations to all of this year’s finalists and winners! 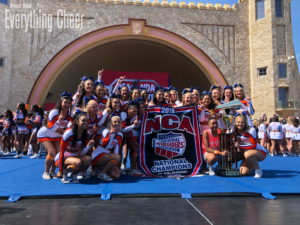 This year’s NCA College Nationals was one for the books, and definitely one of the best in recent memory. View a list of results below, and check out photo galleries of select divisions here.